Team member – Team of Quarter (TOQ – Q2-12) award for SMC project, Open-Silicon. Achiever of Quarter – Technology (AOQ – Q3-09) award for board design and chip characterization, Sasken. Team member – Team of Quarter (TOQ – Q2-08) award for Missouri project, Sasken. Team member – Team of Quarter (TOQ – Q3-07) award for Telserra Project, Sasken. University 2nd Rank, M. Tech Examinations, VTU – 2000. “Validating 2.5D System-In-Package Inter-Die communication on Silicon Interposer“, IEEE EDAPS-2014, Bangalore, IEEE Xplore DOI – 10.1109/EDAPS.2014.7030816. Application Note AN2051, “Precision Digital Controller“, Cypress Microsystems, USA, Nov 2002. Application Note AN2xxx, “Interfacing PS/2 Keyboard using SPI Slave“, Cypress Microsystems, USA, Apr 2005. “Optimized ASIC design integrating 28G SerDes”, Poster presented at DAC-2015, San Francisco, USA. “Validating 2.5D System-In-Package Inter-Die communication on Silicon Interposer“, IEEE EDAPS-2014, Bangalore. “A simple, low cost method for re-balling a BGA device”, WACI paper submission, DAC-2009. “BGA PWB: A Simple, Low Cost Method for Testing Complex Embedded Boards”, WACI paper submission, DAC-2009. “Intelligent Transportation: Fleet Management System“, CYBERIA-2000, National level technical event, IEEE, SJCE chapter, Mysore, May 2000. “SSTV: A new approach in High frequency low bandwidth picture transmission“, CYBERIA-98, National level technical event, IEEE, SJCE chapter, Mysore, May 1998. “Advanced Digital Communication Modes in Amateur Radio“, Southern Region Conference of IETE, Mysore, June, 1998. “Multimode Communication Processor for Computing at RF“, CYBERIA-97, National level technical event, IEEE, SJCE chapter Mysore, May 1997. Secured “Distinctive Excellence” citation in the Cypress Microsystems PSoC High Integration Challenge-2004 circuit design contest. This contest is organized by circuit cellar, USA and sponsored by Cypress Microsystems, USA for my project titled “Multi-Meter for model aircraft/kite” . Secured “Distinctive Merit” citation in the Zilog Flash for Cash – 2003 circuit design contest. This contest is organized by circuit cellar, USA and sponsored by Zilog, USA for my project titled “Data Acquisition System”. Secured “Distinctive Excellence” citation in the Motorola Flash Innovation-2003 circuit design contest. An bi-annual contest organized by circuit cellar, USA and sponsored by Motorola Inc, USA for my project titled “Intellistick: The eye of the blind” . Secured “Honorable Mention” citation in the Cypress Microsystems PSoC Design Challenge-2002 circuit design contest. The contest was organized by circuit cellar, USA and sponsored by Cypress Microsystems, USA for our project titled “Precision Digital Controller using PSoC-CY8C26443-24PI Microcontroller”. Secured 2nd Prize in Hardware Design Contest during Cyberia-2000 in May-2000 held in SJCE, Mysore. Secured 2nd Prize in All India Motorola Discover An Inventor Contest-1999 , for developing an “Fermentation Controller” using Motorola MC68HC705P6A Microcontroller. 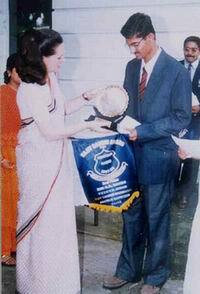 Rajiv Gandhi Foundation Award 1998 , Instituted by Rajiv Gandhi Foundation, New Delhi, presented by Mrs. Sonia Gandhi at New Delhi in Aug. 1998 ( See the photo below ). GOLDEN KEY AWARD for Excellence in CW (Morse Code) Operations Instituted by Old Timers Guild, Bangalore in 1997 with Award Serial Number – 22. Worked All Kerala Districts (WAKD) Award for working all the Districts in Kerala during 1994 with Award Serial Number – 1. An award instituted by Kerala Amateur Relay League (KARL), Kerala. Secured 2nd prize in sector-1 of First “Day & Night Fox Hunt” held in Bangalore in May 1999. Secured Rank 8 in world, in the annual “Hunting Lions on Air contest” (HLITA) held in Jan, 1998 organized by “The International Association of Lions Club”, Illinois, USA. Secured First place in QRP-PHONE category in the 6th annual TRANS-INDIA CONTEST in 1998, a National level on the air contest organized by “Ham Radio Guild”, Cochin. Secured First place in “Queen City Contest” National level CW and phone Contest held in Oct,1997. Secured Rank 20 in world, in the annual “Hunting Lions on Air contest” (HLITA) held in Jan, 1997 organized by “The International Association of Lions Club”, Illinois, USA. Secured First place in “Rajiv Gandhi Memorial National level CW Contest” held in Jan, 1997. Secured 2nd place in QRP-CW category in the 4th annual TRANS-INDIA CONTEST in 1996, a National level on the air contest organized by “Ham Radio Guild”, Cochin. Secured 2nd place in QRP-CW category in the 3rd annual TRANS-INDIA CONTEST in 1995, a National level on the air contest organized by “Ham Radio Guild”, Cochin. Secured First place in 2nd “Royal City Fox Hunt” held in Mysore in Nov, 1995. Secured First place in SWL QSL card collecting in 1993. Collected 93 VU land QSL cards in duration of 2 months.